CHICAGO — On day two of its largest-ever annual conference, the Society for Human Resources Management (SHRM) released its 2018 Employee Benefits Survey. Generally, the respondent group of 3,518 SHRM-member HR professionals has adopted a more diverse set of benefits offerings over the last five-year period, SHRM vice president of research Trent Burner said during a panel analyzing the results. Sixty-seven individual benefit offerings were measured by the survey and are being offered by a larger number of employers in 2018 compared to 2017 data. Moreover, 34% of those organizations surveyed increased their benefits offerings in the past year. But if costs are increasing across the board and HR is still being pushed to reduce business spend, what gives? "It's a lot more voluntary, a lot more choice — it's giving people a menu to select," Malinda Riley, senior principal at Korn Ferry Hay Group, said during the panel. "You need to offer that to get in the door but it's not necessarily saying pay them a lot more or subsidize it." Sixty-two percent of employers offer "health care services such as diagnosis, treatment or prescriptions provided by phone or video," which is up a whopping 28 percentage points from last year's survey when just of over a third (34%) of employers reported offering the same category of benefits. Burner said that a case study from his own experience working to implement virtual visits for a medium-sized employer last year demonstrated the utility of behavior data in addressing healthcare spending. For the cost of one physician visit, the employer could offer a virtual physician and a 90-day generic prescription. "If I can save the [employer] significant money by changing behavior," he said, "I can then take those savings and reinvest them into other, higher cost areas." More than two-thirds of organizations, or 70%, offer some form of telecommuting option to employees, be it on a full-time, part-time or ad/hoc basis, SHRM said. That's up from 62% in 2017 and up from 59% in 2014, according to past SHRM survey data. "Work environment has become such a conversation point," David Scott, executive vice president and CHRO at Dish Network, said during the panel. "We saw the trends years ago with 'hoteling' and working from home and we've seen a national gravitation to people having their own workspace." A total of six parental leave benefit categories saw increases in organizational offerings in 2018 compared to last year. Maternity is by far the most common, with 35% of respondents indicating that the benefit was offered at their organization, followed by paternity leave (29%), adoption leave (28%), parental leave (27%), foster child leave (21%) and surrogacy leave (12%). As an aside, paid leave benefits also rebounded to a level not seen since 2015 — 27% of employers. Parental leave has been a fairly active news-maker in the past year, including Estee Lauder's announcement that it would offer 20 weeks of paid parental leave for both male and female employees. Employers are also paying attention to the processing of returning employees back to work; PwC said it would allow new parents to work 60% of their normal schedule at 100% of their pay for four weeks after returning to work. PwC also extended its allotted paid parental leave to eight weeks per employees. Scott emphasized the importance of using annual or biannual employee surveys to gauge what employees want from their benefits, but also said that employers should not overreact to all of the headlines made by particularly generous leave offers. "It's a great headline, but not where the majority of organizations are," he said. "Really being clear on who you are and who you want to be [as] an employer, helps you make these decisions on a daily basis." Just 4% of respondents said they are offering a company-provided student loan repayment benefit. On the other hand, over one third (35%) are offering financial advice services online, and 34% are offering such sessions in a one-on-one type format. Repayment benefits are not tax-exempt for employers, something that a handful of legislators have sought to change, but there remains no change on the issue. That employers are taking a second look at financial wellness is no surprise, however, due to the role that it plays in managing stress and improving both engagement and retention. Employees who take a week or more of vacation time are more engaged than those who don't, a new O.C. Tanner survey found. The poll of more than 1,000 workers across the U.S. showed that for those who take sufficient vacation time, there is a positive correlation between work ethic and employee engagement. Among employees who take a week or more of vacation, 70% say they're driven to contribute to their organization's success, as opposed to the 55% who don't regularly take a week of vacation; 65% say they feel strongly about working for their organization a year from now, compared to 51% who don't take a week off in the summer; and 63% say they have a sense of belonging at their company, compared to 43% percent of respondents who skip at least a week of vacation time. Although workplaces feel the strain of worker shortages due to summer vacations, encouraging employees to take sufficient time off can pay off in engagement, retention and productivity, O.C. Tanner said. Many employees have trouble taking their allotted vacation because they feel guilty about taking time off, think they're the only one who can do their job or believe their company's culture discourages taking full vacation time. But there are consequences for skipping vacations; for example, a 2017 CareerBuilder study revealed that people who don't take enough time off are more stressed, which can lead to health problems, absenteeism and lower productivity. Burned out employees aren't likely to feel engaged or committed to their job, so HR may want to create a clear vacation policy — and instill a vacation-friendly culture — to encourage employees to take time off. Some have toyed with making vacation mandatory, while others have tried adopting an "unlimited" (or, at least, untracked) vacation system to encourage people to take the time they need. Some also prohibit employees from carrying vacation time over into a subsequent year, a method that can keep workers from leaving vacation days "on the table." Every year, the IRS announces the annual limits for various types of employee benefits, such as Health Savings Accounts (HSAs). The IRS has already changed the 2018 annual limits for HSAs twice this year, which may have caused some confusion. As background, amounts contributed to HSAs will not be subject to federal income tax up to the annual limit. Employees and employers can only contribute amounts for employees who are enrolled in a high deductible health plan (HDHP) and who do not have non-HDHP health coverage. If an employee withdraws amounts from the HSA and does not use them to pay for qualified medical expenses, the employee may incur a tax penalty. Unlike flexible savings accounts, the contributed amounts cannot be forfeited at the end of the plan year. Instead, they are placed into a savings account that employees can use even after they terminate employment, making them an attractive benefit to employees. For 2017, the annual limit for self-only HSA coverage was $3,400 and the annual limit for family coverage was $6,750. In May 2017, the IRS announced the 2018 limits: individuals with self-only coverage would be able to contribute up to $3,450, and individuals with family coverage would be able to contribute up to $6,900 to their HSAs. By January 2018, employers and service providers had programmed their systems to reflect the new 2018 limits, and, starting with the first payroll period in 2018, employees began to contribute to their HSAs. But in March 2018, the IRS announced a mid-year change. The IRS announced that while it would not change the self-only coverage limit, it would be reducing the family contribution limit by $50 to $6,850. At the same time, the IRS also announced that it would be reducing the annual limits for adoption assistance programs. Originally, the maximum exclusion per adoption was set at $13,840. The IRS reduced this amount by $30 to $13,810. With regard to the adjusted gross income levels, the phase-out was slated to begin at $207,580 and be completed at $247,580. These figures were each reduced by $440, so that the phase out would begin at $207,140 and be completed at $247,140. Some stakeholders complained about the mid-year changes; in particular, the reduction in the annual HSA limits received the brunt of criticism. They informed the IRS that some employees might have already contributed the maximum $6,900 and would have to seek a return of an excess contribution or be subject to excise taxes. Additionally, many employees who aim to contribute the maximum amount to their HSAs typically divide the annual maximum by the number of payroll periods so their paychecks are steady throughout the year. These employees would need to adjust their contributions to adapt to the changes, which might prove troublesome. After receiving these complaints, the IRS released yet another Revenue Procedure in May 2018 increasing the family contribution limit back to $6,900. As such, the current HSA limits are $3,450 for self-only, and $6,900 for family. Interestingly, the IRS has not changed the adoption assistance programs limits. While many stakeholders may be relieved that the limits were increased back to $6,900, there may still be practical implications for employers who offer HSAs to their employees. Before the May Revenue Procedure, some employers may have already distributed any amounts in excess of $6,850 to employees. If your organization did so, you may want to notify employees that it is possible for them to contribute up to $6,900, and, if they would like to contribute additional amounts, they may do so (up to the limit, of course). Employees also may have questions regarding how the excess distribution will be treated. The IRS regulations and the May Revenue Procedure make clear that these amounts will generally not be included in the employee’s gross income, and will not be subject to the 20 percent excise tax. Additionally, since the limits changed twice, some employees may need additional assistance to calculate how much they should contribute for the remainder of the year to avoid exceeding the revised annual limits. As health care costs increase, employers have been exploring new types of health coverage options, one of which is reference-based pricing (RBP). This method typically does not involve a traditional insurance carrier or provider network negotiating covered services for the plan. Instead, employers will set a fixed limit on the amount a plan will pay for certain healthcare services. Let’s say that a participant needs a certain kind of surgery, and a hospital would expect to be paid $2,500 for it even if some insurance carriers may have contracted to pay less than that. The Medicare rate is $500, and the reference-based pricing plan’s fixed limit is 200 percent of the Medicare price, which comes out to $1,000. With RBP, the hospital may perform the service and expect to receive $2,500. Once the hospital is only paid $1,000 from the employer, it may seek the $1,500 balance from the patient. This concept is referred to as “balance billing.” The patient, the employer, or a third-party administrator may then help negotiate down the amount of the balance billing. Of course, there are varying degrees of success for these negotiations. From the employee’s perspective, however, this situation may not be ideal—they may feel uncertain about the amount they will end up paying out of pocket for a procedure, and figuring out the cost ahead of time may require significant research. For RBPs to have cost savings, employees must be well-informed consumers. The Affordable Care Act (ACA) limits the amount of an individual’s out-of-pocket expenses for in-network health care costs. RBPs do not have traditional networks, so government agencies issued guidance on the subject to ensure employers did not use RBPs to circumvent out-of-pocket maximums. The types of services that are subject to RBPs. For example, RBP will not typically work for emergency services since the employee does not have an opportunity to select or shop for a service provider. Whether the plan offers reasonable access to an adequate number of providers. This can be a particular challenge in rural areas where provider options may be limited. Whether the providers meet reasonable quality standards. Whether the plan has an easily accessible exceptions process for participants who have special circumstances. Whether the plan has adequately disclosed information to participants regarding the RBP, such as providing a list of services and pricing. While there certainly have been payment disputes between employers, participants and healthcare providers over RBP, there has been little litigation over the matter. Disagreements over these issues are typically resolved via negotiation, and employers will often cover any balance billing. There is, however, a lawsuit before a federal appeals court over a reference-based pricing dispute. If the hospital prevails, RBP may become more difficult to implement because providers may start to seek the entirety of the balance billing, rather than engage in extensive negotiations. In the case at issue, the employer used an RBP and did not have a negotiated contract with the hospital. The employee went to the hospital for a heart attack and received a bill of nearly $100,000. The employee and the plan paid approximately 25 percent of the bill and encouraged the hospital to accept the payment in full, in part, because the hospital had accepted that amount as full payment for other uninsured patients. The hospital, however, continued to seek payment for the balance. The hospital has argued that the employee signed an agreement consenting to the full price of the services, so the patient should be contractually required to pay the full amount despite the fact that the hospital accepted lesser amounts from other uninsured patients. Regardless of the outcome of this case, employers who are intrigued by reference-based pricing should do their research to learn more about how RBP will work for their employees. Employers should pay particular attention to employee education and communications regarding RBP, since a surprise six-figure balance bill could quickly become a significant employee relations issue. New survey findings confirm what many U.S. workers have already learned: As annual salary raises have held steady at around 3 percent, annual bonuses tied to performance have become a bigger part of compensation. While use of cash-based short-term incentives (STIs) is well-documented at large, publicly traded corporations, it is also becoming a common way to motivate and reward employees at private companies, especially at small and midsize firms as well as at nonprofit employers, new research shows. WorldatWork, an association of total rewards professionals, recently surveyed incentive pay plans at privately held companies (those without publicly traded stock) and noted the findings in the report Incentive Pay Practices: Privately Held Companies. A companion report focused on nonprofit organizations and government agencies: Incentive Pay Practices: Nonprofit/Government. Both studies draw on polling of WorldatWork members (total rewards professionals mostly at large U.S. employers) in December 2017. Approximately 215 private, for-profit companies responded to the survey, as did more than 110 nonprofit and government organizations. To put the number of companies using short-term incentives in perspective, consider these numbers: There are more than 6 million privately held companies in the U.S. and more than 1.5 million nonprofit organizations. Fewer than 4,000 U.S. companies are publicly traded, according to government statistics. "Spending on short-term incentives increased modestly at private companies from 2015 to 2017, which reflects the tight labor market and competition for talent," said Bonnie Schindler, partner and co-founder of Vivient Consulting, which partnered with WorldatWork on the research. 96 percent had STI programs, up from 94 percent. Spending on short-term incentives increased to a median of 6 percent of operating profits, up from 5 percent. About 66 percent of nonexempt employees were eligible for annual incentives, up from 52 percent. Nineteen percent of private companies used team or group incentive plans in 2017, a drop from 22 percent in 2015, perhaps in part because of concerns that such payments benefited workers who may not have put in as much effort as their colleagues. "So-called free-riders can definitely be a problem with team/group incentives," Schindler said. "We did see an increase in spot awards and discretionary awards," which focus on individual efforts, she noted. Most private-company respondents were cautious about giving managers discretion in granting annual incentive-plan awards, noting that the rationale for discretion was often poorly communicated, and its use tended to undermine the fairness and consistency of award payouts. Annual incentive plans, by far the most commonly awarded short-term incentive, are given to individuals based on achieving results identified at the beginning of the performance cycle. In discretionary bonus plans, management determines the size of the bonus pool, but these plans have no predetermined formula, and awards are not guaranteed. Spot awards recognize special contributions as they occur for a specific project or task. Profit sharing plans provide for employee participation in an organization's profits. Team/small-group incentives focus on the performance of a work team. While long-term incentives based on meeting performance goals over a multiyear period are a common component of executive pay, they remain seldom used for nonexecutive employees. STI programs, however, are becoming more popular and are used for employees at all levels of an organization. At private companies, the median annual incentive plan award level for CEOs is 80 percent of salary, with targets decreasing by about half for each lower position level in the organization. 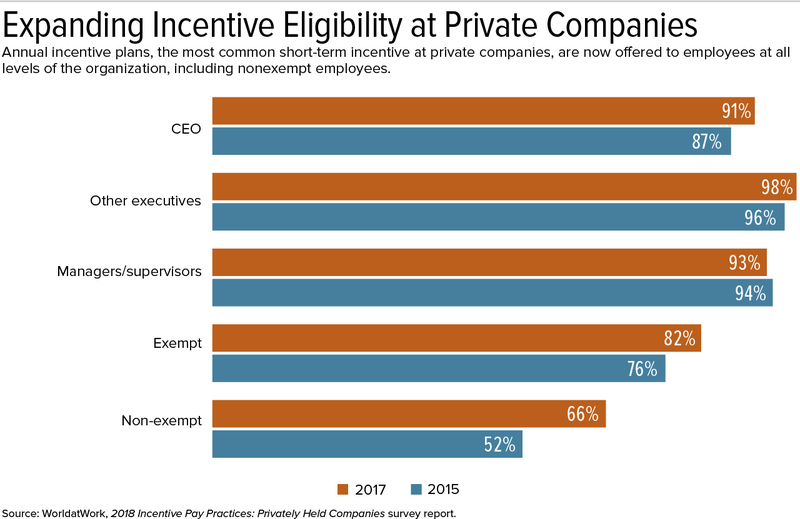 Source: WorldatWork, 2018 Incentive Pay Practices: Privately Held Companies survey report. 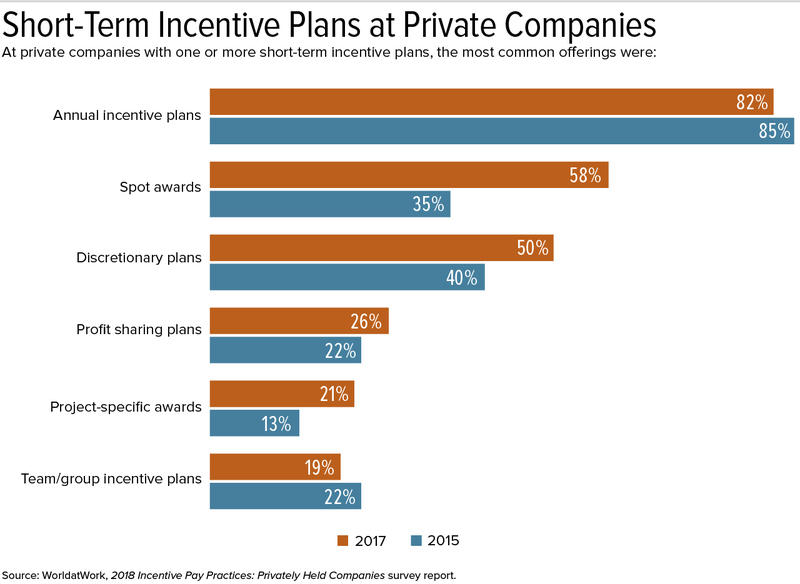 Despite the growth of short-term incentives, most private-company respondents consider their annual incentive plans to be only moderately effective, with plan communication, the level of discretion, goal setting and the risk/reward trade-off noted as areas for improvement. "There continues to be focus on reducing the complexity of short-term incentive design and establishing a more rigorous process for setting company and individual performance goals," a recent report on executive compensation by consultancy Willis Towers Watson stated. Other research shows simplicity is especially valued when implementing broad-based employee incentives, particularly at smaller organizations. Smaller organizations do less of every kind of variable pay except for profit sharing, where small and midsize organizations beat out their larger counterparts, PayScale's 2018 Variable Pay Playbook shows. The report draws on the firm's survey of 7,100 pay managers at companies of all sizes, conducted in November and December last year. From Hollywood to the White House, the issue of the gender wage gap is a hot topic. Although the Equal Pay Act has been around for decades, pay disparities persist. As a result, there is a renewed focus on equal pay on the state and local level, which has led to new laws and regulations promoting fair pay. One way in which some states and municipalities are seeking to close the wage gap is by enacting laws banning or restricting salary history questions during the hiring process. Connecticut became the latest state to ban such inquiries when Gov. Dannel Malloy signed a pay equity law on May 22. According to the National Partnership for Women & Families, women in Oregon earn just 81 cents for every dollar paid to men. Oregon is another state that has passed a salary-history inquiry ban to create a path toward closing the gap between the wages of women and men. In those locations, asking, "What's your current salary?" has been part and parcel of the hiring process for as long as employers have been hiring employees but may no longer be permitted. The reasoning behind these laws is that if an employer relies on an applicant's salary history to determine compensation, it perpetuates the gender wage gap. These laws therefore restrict an employer's ability to seek salary history information in an effort to eliminate the differences between what men and women are paid for either equal or comparable work. A job applicant's skills and qualifications should determine salary and not compensation history. With the new changes in legislation banning salary history questions, employers need to be aware of the laws in the states and municipalities where their employees are located. At least 12 jurisdictions have passed laws banning employers from asking job applicants about their past or current salary, and this trend will likely continue. Connecticut (effective Jan. 1, 2019). In addition, Albany County, N.Y.; New York City; Westchester County, N.Y. (effective July 9); Puerto Rico; and San Francisco (effective July 1) have enacted salary inquiry laws. Philadelphia's ban was slated to take effect in 2017, but a federal judge halted part of the ordinance, finding that a law prohibiting employers from asking candidates to reveal their past salaries violates the First Amendment's free-speech clause. However, the judge said that the city is allowed to stop employers from using past salary information to set pay rates. Some jurisdictions, such as New Jersey, New York and New Orleans, prohibit certain public employers from asking about salary history. While all of these laws aim to eliminate the pay gap between men and women for performing the same or comparable work, each law places different restrictions on employers. For example, in Delaware, an employer may seek an applicant's salary information for the sole purpose of confirming it, only after it extends a job offer with the terms of compensation that the applicant has accepted. Some laws, such as in San Francisco, permit an employer to consider or verify an applicant's salary history if he or she voluntarily discloses it without prompting or provides written authorization. Although there are variations among these salary-history inquiry laws, in most cases, an employer may ask a job applicant about his or her salary expectations. According to Cheryl Pinarchick, an attorney with Fisher Phillips in Boston, asking salary expectations is within bounds. "It's a good way to figure out if you should continue a conversation with an applicant. Are they in the right ballpark for what the job is going to pay?" Further, objective measures of productivity, such as sales history or billable hours, could be a legal justification to pay people differently. In fact, the New York City law excludes an objective measure of productivity, such as revenue sales or other production reports from the definition of salary history. However, employers should use caution with respect to searching public records for a job applicant's salary history information. Whether it is allowed, Pinarchick said, "all depends on what state you're in and what state they're in, or what city you're in and what city they're in." Regardless, Pinarchick recommends that employers avoid doing so. Even if an employer is not prohibited from looking it up, an employer may or may not be able to use that information under the broader pay equity law. An applicant could come back and claim the employer did not hire him or her or that the applicant is paid less because of that salary information, which may be illegal under the law. It seems likely that laws banning salary history inquiries will continue to gain traction across the country. Employers should therefore ensure compliance with these laws through smart planning by training managers, supervisors and HR personnel involved in the hiring process, particularly those individuals conducting interviews, and update job applications and other documents that seek this information. With more salary-history inquiry bans on the horizon, employers should also be vigilant in tracking these developments to ensure compliance. Melissa A. Silver, J.D., is a legal editor with XpertHR. The IRS recalculated the family cap downward in March after Congress revised the inflation adjustment for many employer benefit rates. In April, the IRS granted relief that restored the family cap back to the original 2018 level. "The contribution limits for various tax-advantaged accounts for the following year are usually announced in October, except for HSAs, which come out in the latter part of April or early May," explained Harry Sit, CEBS, who writes The Financial Buff blog. As an inflationary measure, chained CPI rises at a slower rate than the more traditionally used CPI, since the chained CPI allows for consumer substitution among the goods and services that make up the index. For this reason, despite an uptick in the inflation rate this year, the increase for self-only coverage for 2019 was the same as for 2018 (up $50), and the increase for family coverage was smaller than was set for 2018 (up $150). The recently introduced Chronic Disease Management Act, for instance, would amend the tax code so that HDHPs paired with HSAs could cover chronic disease treatment on a pre-deductible basis. Source: SHRM's forthcoming 2018 Employee Benefits report (June 2018). By Jeff Nowak © Franczek Radelet P.C. When it comes to administering leave under the Family and Medical Leave Act (FMLA), I'll admit I've grown cynical and hardened about employee scams. It's not just the "medical leave" that turns out to require a beach vacation. Caring for your dying mother when, in reality, you need leave to serve a 60-day jail sentence for DUI? Yep, heard that one before. Nevertheless, there truly is a need for federal and state leave laws, as many employees are dealing with legitimate medical conditions that render them unable to perform their job—and these people are counting on HR leave managers to help them. Each spring, I'm reminded of this at the Disability Management Employer Coalition's (DMEC's)FMLA/ADA Compliance Conference, where FMLA and Americans with Disabilities Act (ADA) nerds convene to discuss leave and accommodation issues. This year, I co-presented an overview of key FMLA and ADA cases from the past 12 months (here's the PowerPoint). For several days, we put cynicism aside and focused on practical and meaningful ways employers can support their employees when they or their loved ones deal with medical issues that keep the employee away from work—all while keeping business operations humming. 1. Recognize that the far majority of our employees use FMLA leave appropriately and for real medical needs. This should be our frame of reference when we are faced with an employee's request for medical leave or workplace accommodation. When you approach the situation with a level of sincerity rather than cynicism, you are more likely to be met with sincerity in return. To that end, let's not assume without any basis in fact that our employee is trying to misuse their leave of absence. 2. Be empathetic; the words, "How can I help you?" can go a long way. When you communicate with employees, use words that show that you're on the same side. You want to help them take the time they need to get better and then return to work. Let your communications reflect this sincerity and empathy. 3. Treat all requests for leave as a request for a reasonable accommodation as well. Each time an employee requests leave from the job because of a medical condition, the request should be analyzed through the lens of both the FMLA and ADA. Where employees need leave from work because of a serious medical condition, use it as an opportunity to engage with them to determine how to best address their situation to keep them engaged and at work. A leave of absence is only one tool to help maintain a productive and healthy workforce. 4. Train managers to help you achieve the kind of workplace you're trying to cultivate. At the conference, FMLA Branch Chief for the Department of Labor, Helen Applewhaite, identified several compliance problems that pop up regularly during DOL investigations. She noted that frontline managers often fail to recognize when an employee may need a leave of absence protected by the FMLA. Even worse, some make derogatory comments about an employee's use of FMLA leave. Indeed, many frontline managers simply are not properly trained to recognize when an employee has provided sufficient facts to trigger the FMLA and to take appropriate steps to respond to the employee's request. In my experience, this is perhaps the single biggest problem for employers, as it creates easy liability. There are far too many examples of employers who have paid out a lot of money because their manager said something foolish about FMLA, did not properly handle an absence covered by FMLA or did not follow FMLA regulations. Managers at all levels drastically increase your liability when it comes to FMLA when they are not trained in the FMLA. Training them now will immediately reduce your risk of liability—both in court and as a result of a DOL investigation. Every once in a while we need this simple reminder: Be sincere, be empathetic and FMLA and ADA compliance will follow. Look at it as your Kumbaya moment. 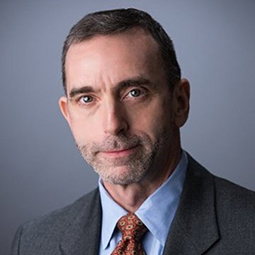 Jeff Nowakis a Chicago-based partner and co-chair of the labor and employment practice at Franczek Radelet P.C. and author of the FMLA Insights blog, where an unabridged version of this article originally appeared. © 2018 Franczek Radelet P.C. All rights reserved. Republished with permission.